When I was in the middle of my weight loss, I weighed myself every day. Almost everything I read about it said that I was doing it wrong, that I should have had a Weigh-In Day once a week. I tried it, but it didn’t work for me. I couldn’t stand it. Seeing how I was doing on a daily basis motivated me to either do better and kick it up a notch or continue going strong. It wasn’t a negative experience for me. Once I hit my maintenance phase, though, I stopped. I currently have a 5-pound range I allow myself to be in (160-165), and as long as I’m within those 5 pounds, I’m doing okay. If I’m heavier or lighter, I do a little more digging (checking body composition, testing various sizes of clothing to see how they fit, etc.) before freaking out one way or the other. Or at least I did. About a month ago, I stopped weighing altogether, and it has been liberating and awesome and wonderful. For a recovering weight-loss addict like me, that was a big decision to make. But it finally got frustrating to see my weight be 161 one day, 164 the next, and then 168 inexplicably for two days before dropping back down to 163. It was infuriating. Because for four years, weight loss (and maintaining that weight loss) has been in the background of almost every decision I’ve made about myself. Consistent numbers on the scale validated me, in a lot of ways. But when the numbers weren’t consistent, I had no way to tell if I was doing well or poorly. The reason it was so bad for me was because during the winter when I was unable to run, I gained about 10 pounds (went up to 172 at my highest) and around a pants/shirt size–which severely limited my wardrobe options. My goal this summer was to “get off the winter pudge” more than anything else. But when my increased running and fresh eating didn’t appear to equate to any weight loss, I got mad. Really mad. So I said screw it. I stopped weighing. I went against the main thing that had kept me going for 4 years because something was broken, and I was tired of getting mad when I knew I was doing everything right. Without being a slave to the scale, I have just been going by what my body tells me. I’m not worried about weight so much as I am about how my clothes fit. Since I stepped off the scale and focused on quality of exercise and food (read as: quality of life), I’ve been able to wear pants and underwear that were much too small for me in June, as well as fitting into shirts that grabbed and squeezed that winter pudge like a tube of chorizo. Even after the nasty weekend I had that made me feel like a dead man, I was only at 162 when I decided to give it a shot and see where I was afterward. My point in telling you all this is that weight is just a number. It’s an easy goal and a tool for tracking your overall health and wellness, but it’s not the be-all/end-all of life. There are other elements of health and fitness that matter just as much, if not more. For me, it’s fitting into the clothes I want to and being able to run more and more so I can hit that half-marathon in October. If I can wear what I want and run my goal, the number on the scale doesn’t matter even a little. So maybe all those experts to say not to weigh everyday were right, after all. I might be just a little slow on the uptake. 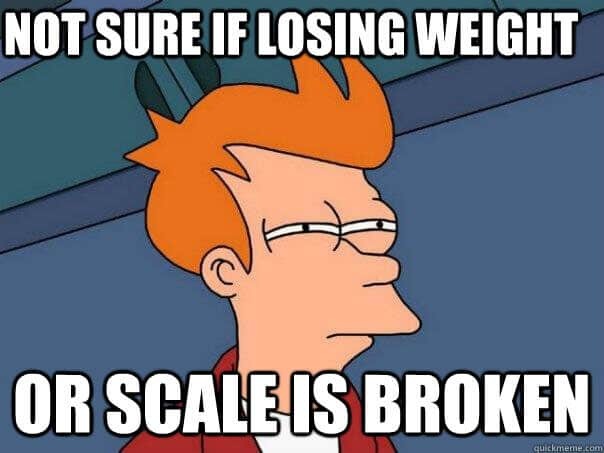 Do you have any make-up/break-up stories about your relationship with the scale?